So what is BIZ, you may be asking yourself? No two stains are the same, so different stains require different ingredients to be rid of them. Sadly there is no one ingredient to clean them all. So why not have all of them in one? 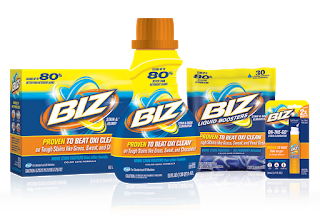 Most brand do not offer that, but BIZ® didn't cut any corners... Biz has more stain fighters than other brands. That's why it works better. As you can see Biz realizes we don't live in a bubble and we are going to get several kinds of stains. So the fight them all. Look below to see how the stand up against the competition.